In the callused hands of director David Mackenzie...the rigorously tough-minded Asylum lives up to its potential as a modern masterpiece of psychological terror. 97 min. Paramount Classics. Director: David MacKenzie. Cast: Natasha Richardson, Marton Csokas, Ian McKellen, Hugh Bonneville, Augustus Jeremiah Lewis. The two Patricks who share responsibility for the script of Asylum have reputations for exploring the morbid, cynical psyches of ostensibly comfortable Brits. 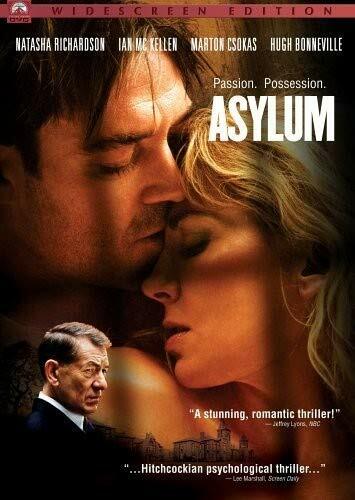 In 1996, novelist Patrick McGrath (Spider) published Asylum, and 2005 sees the release of the film adaptation, co-written by Closer scribe Patrick Marber (Chrysanthy Balis shares credit). In the callused hands of director David Mackenzie (Young Adam), the rigorously tough-minded Asylum lives up to its potential as a modern masterpiece of psychological terror. In 1959, the Raphael family relocates to the coldly indifferent grounds of a high-security mental hospital secreted in the Yorkshire Dales. Dr. Max Raphael (Hugh Bonneville) has accepted the position of deputy superintendent, meaning adjustments will have to be made by his wife Stella (Natasha Richardson, who also executive produces) and their son Charlie (Gus Lewis, last seen as young Bruce Wayne in Batman Begins). Charlie is easygoing, but Max must admonish Stella to behave herself, even as he strains to remain civil. At a welcoming garden party, the asylum's superintendent omniously makes light of "the confined and confused...the present company, not the patients." When Stella fails to find purchase in the trappings of her new house or the ladies' auxiliary, she becomes rapidly disenchanted and crosses over from the "safe" and "sane" side of the asylum to the roiling snake pit of the patients. Though she noodles a bit with senior psychoanalyst Dr. Peter Cleave (Ian McKellen), a man at the intersection of the asylum's two paths, Stella finds a willing conspirator in inmate Edgar Stark (Martin Csokas). She finds herself helpless to resist his intense gazes, despite his crime: the jealousy-fueled murder and desecration of his wife. The word "asylum" refers, of course, not only to an institution, but any place of safety, of refuge, a notion that echoes in Stella's dark journey of the soul. At first, she asks her husband if Stark is "safe" for Charlie to be around, though her curiosity comes to intense fruition when—in a tumult of shame and excitement—Edgar and Stella consummate their lust. The danger is part of the attraction, but the question never goes away. When they're deep into trouble, Edgar explains, "I had to wait until it was safe." Stella responds, "And it's safe now?" Decidedly not, but Pandora has opened her box, so to speak, and there's no return to the dull love of family. Asylum is so thrilling because it is so wrong. Mackenzie unflinchingly presents an irresponsible protagonist who's out of control, yet we share in her exhilaration, revulsion, abandon, and madness. Stella's inner darkness emerges to blot Natasha Richardson's handsomeness—with sore eyes, Richardson fearlessly delineates an emotional wreck that anyone is capable of becoming, by simply following an impulse of desire instead of habitually repressing it. The tale is so deeply unsettling because it explores the consequences of the horribly plausible decision that madness is preferable to boredom. Because of its tenacious understatement, Asylum is bound to be underestimated, but it is crafted with highly-skilled precision by Mackenzie and his collaborators. There's not an ounce of fat on Marber and Balis' script; the barbed dialogue lands every blow but never showboats. Outstanding, shadow-diffused photography (Giles Nuttgens), seductive scoring (Mark Mancina), and delicate but efficient editing (Colin Monie and Steven Weisberg) keep the story moving with a tidal pull. As for the supporting cast, Csokas does his finest work ever, and McKellen is all gestural genius as the possessive, Machiavellian Cleave (he, too, is "confined" and "confused" by his unspent sexuality). History has taught us that romantic obsession is not merely a conceit of fiction. Animal attraction has left bloody trails through our concrete jungles, and though Asylum may not be an ordinary Saturday-night date movie, it is alive with the most turbulent emotions; it dissects the most terrifying human compulsions. No one is safe. Given that Asylum is an acquired taste (and that Paramount's initially pricy home video edition is less than stellar), the Asylum DVD is best recommended as a rental for now. Those who loved the film on its theatrical release should not be deterred from owning the film, but consumers should be prepared for a lack of extras (unless you count previews for The Weather Man, Après vous..., Mad Hot Ballroom, Winter Solstice, and The Machinist) and a lackluster, soft transfer. For a brand-new film, Asylum shows a surprising amount of dirt and digital artifacts (occasional shimmers, halos, etc.). Asylum is a sunken treasure, and since an upgraded disc will most likely never arrive on the DVD format, here's your chance to take the plunge. All site content © 2000-2019 Peter Canavese. Page generated at 04/19/2019 02:28:56PM.